Sharks are some of the most feared sea creatures in the world. However, you’re more likely to drown in the water than get killed by a shark. Statistics show that more people are killed by seemingly less dangerous animals like dogs and cows than by sharks. That being said the International Shark Attack File (ISAF) reports that at least 80 unprovoked attacks are reported every year. Western Australia is the deadliest place in the world, having recorded the highest number of fatal attacks in the world. Despite their rarity, sharks continue to strike fear into the minds of many around the globe. However, scientists tell us that most shark species are dwindling, hence, need to be protected from us far more than we need to be protected from them. There are more than 480 shark species in the world, but only three have hit double-digits for fatal unprovoked attacks and these account for more than half of the total unprovoked attacks. These different species have different characteristics such as size and behavior hence some are more dangerous than others. While your diving instructor will tell you that the most dangerous shark is always the one swimming towards you, only a few species are prone to attacking you. The sand tiger sharks are large-bodied with sharp teeth protruding in all directions. Despite their fierce look, they are docile and non-aggressive hence are common in aquariums around the world. They can be found in warm, coastal waters in the Indian, Pacific, and Atlantic oceans. The sharks can grow to a length of up to 3.2 meters and a weight of 350 pounds. The ISAF indicates that there have been at least 29 unprovoked attacks, but all have been non-fatal. 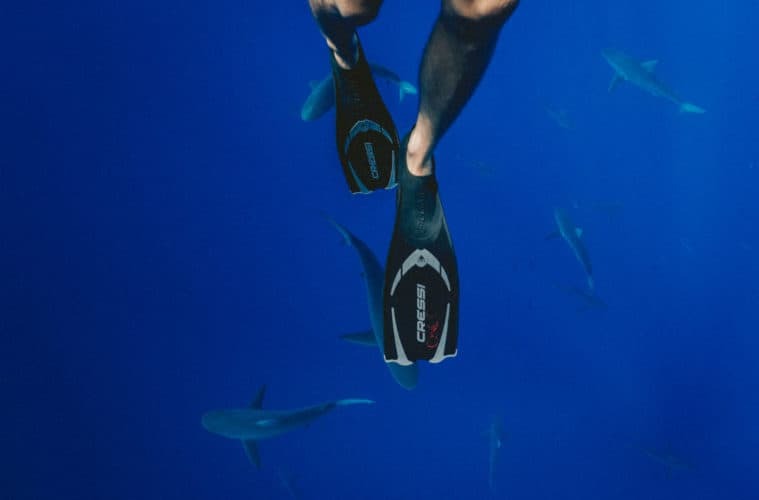 Most of these attacks are associated with shark feeding, line fishing, and spearfishing. Also known as the bronze shark, the narrowtooth shark, the cocktail shark, and the bronze whaler, the copper shark is a large shark with distinct, hook-shaped, narrow upper teeth and plain bronze color. It lives mostly in warm subtropical waters across the world. The shark is one of the most dangerous sharks because it swims fast and hunts in large groups. The sharks attack spear fishermen and have bitten many swimmers in New Zealand and Australia. Out of every ten shark attacks in New Zealand, copper sharks are responsible for three. The blacktip is common in coastal subtropical and tropical waters worldwide. Though they are smaller in size, they are swift and energetic. The sharks become aggressive when they see or smell food. They are important for their meat, fins, liver oil, and skin. The ISAF had recorded at least 28 unprovoked attacks and 13 provoked attacks by the shark as of 2008. Additionally, the species is responsible for 16 percent of all shark attacks around Florida. Blacktip sharks favor coral reefs, bays, and shallow waters off beaches hence likely to cross paths with humans. Though not as fearsome as the great white, tiger or bull sharks, oceanic whitetip shark is a danger to air crash or shipwreck survivors. This large shark lives in tropical and warm temperate seas and is suspected to be responsible for the most fatal bites on survivors of shipwrecks, for instance, the Nova Scotia ship which sank during World War II and the USS Indianapolis in 1945. Though it swims slower than most sharks, it is very aggressive. However, despite being dangerous, it actually requires protecting from man as its population is declining due to excessive fishing. Its large fins are of great value commercially as they are the primary ingredient of shark fin soup. Among the most dangerous sharks which are likely to attack humans, bull sharks prefer to dwell near high-population areas such as tropical shorelines and shallow coastal waters. Though bull sharks are medium-sized, they are fast and very aggressive. They can survive in freshwaters unlike other sharks and often like to swim far up rivers. Due to these traits, some experts consider them as the most dangerous of all shark species. There have been at least 100 reported cases of unprovoked attacks by these sharks. Additionally, they are responsible for biting swimmers and bathers in Sydney and India respectively. The tiger shark is large and can attain a length of over 5 meters. It’s mainly found in tropical and temperate waters. Tiger sharks are known to have the broadest food spectrum and can eat just about anything. Apparently, various weird items have been found in their bellies, including cans of paint, drums, and cigarettes. Therefore, while other sharks might bite and leave you, the tiger shark is more likely to eat you once it bites. According to the ISAF, tiger sharks are responsible for 111 unprovoked attacks with at least 30 being fatal. Common in the coastal surface waters of all the oceans of the world, the great white is believed to be the most deadly of all shark species. Despite being over 6 meters and weighing over 3 tons, this shark is no slouch and can swim fast up to a speed of 35 mph. Its speed, strength, and powerful jaws make its attack highly lethal. Statistics from the ISAF show that there have been at least 314 unprovoked attacks by the great white, with over 80 being fatal. As if the statistics were not enough, the Jaws movies demonized the shark by portraying it as a ruthless man-eater. The truth is Great whites mistake humans for seals and are not really interested in attacking humans. Not when a fatty seal is swimming nearby. After extensive research and sifting through various shark attack records, it is clear that out of the over 400 species, only a few attack humans, most of which attack when provoked. It is rare for sharks to attack people, but when they do, the results can be terrible. There have been many reports of fatality and also of victims ending up chunks of their body missing. One thing to note though is that a lot of shark attacks are not reported hence there could be more attacks than presented by the various shark attack data. So, the next time you go fishing, surfing, swimming or diving, be careful and watch out for sharks that favor the shallow waters such as blacktip sharks and bull sharks. Most importantly, don’t provoke any shark.